Scales for inventory control and warehouse logistics operations. Inventory control procedures are an essential part of any successful business operation, therefore it is crucial that you have the best equipment to streamline the process and maintain busy schedules. Adam Equipment supply a wide selection of weighing scales ideal for warehouse logistics operations; our scales combine intuitive parts counting and checkweighing features with durable materials to provide purpose-built warehouse weighing machines suitable for almost any small - large scale shipping operation. Our bench postal and parcel scales are ideal for post offices and mail rooms; constructed from high-quality ABS plastic and fitted with a solid stainless steel weighing pan that can be easily cleaned down after use. Many of these specially-designed shipping scales include both parts counting and checkweighing functionality, allowing operators to accurately check boxes of products meet predefined weight limits prior to being placed in storage or on distribution lorries. NMI approved bench scales easily fit on postal office desks and can be used by postal workers to determine shipping costs by weight when sending packages. Floor scales and platforms are perfect for weighing large or heavy items on a warehouse floor such as mail bags, parcels and packaged merchandise. Our floor scales are constructed from water-resistant, sealed stainless steel to prevent water and dust ingress, whilst our sturdy weighing platforms can be combined with Adam weighing scale indicators for expanded weighing operations. Our selection of specialist pallet scales a specially designed for use in warehouse environments. 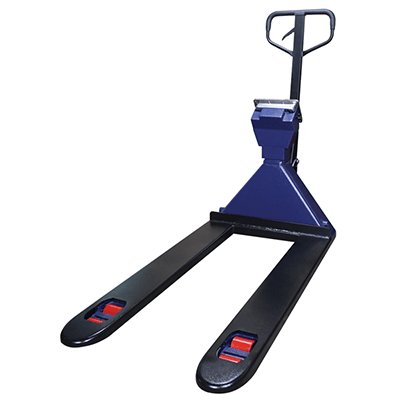 Pallet jack scales allow pallets of goods to be simultaneously moved and weighed using a sturdy handle and integrated wheels. Our pallet beams feature two elongated steel weigh bars connected with a shielded cable and weighing indicator; the beams can be moved closer or further apart depending on the size of the object that needs to be weighed. Adaptable, efficient and reliable, Adam scales are the ideal choice for operators looking to streamline large-scale shipping and logistics processes.